I LOVE mushrooms, but my family does not. Can anyone else relate? Just to be nice I usually avoid dinner recipes with mushrooms, but every now and then I just get a craving and decide to make something with them anyway … thinking they can just pick them out if it’s really that much of a problem. It’s certainly not hard to do if they aren’t cut too small. 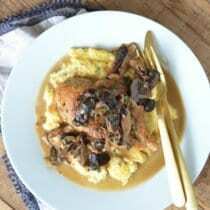 But when I recently made this Chicken & Wild Mushroom Skillet, I decided that while they could pick them out, I certainly wouldn’t suggest it or even say a word about the dreaded mushrooms that suddenly appeared in our dinner. And guess what happened? (I bet you can guess where I am going with this, haha.) No one said a word, me included, and just ate their entire serving as is! I couldn’t believe it. Maybe it was the sauce, maybe it was because they were “wild” mushrooms instead of standard, maybe it was the alignment of the stars – who knows, but I certainly didn’t start asking any questions. I hope your family enjoys this one as much as mine did! Oh, and I included the polenta recipe below that was fabulous paired with this (as pictured). Just add a simple green salad on the side, and your healthy dinner is done! Use a tenderizer to pound the chicken on both sides. Really use some elbow grease here! In a large skillet over medium heat, pour in 1 tablespoon of the olive oil. Add the chicken thighs or breasts, season with salt and pepper, and cook until golden brown on both sides and no longer pink in the middle, about 4 to 6 minutes per side (depending on the thickness of the chicken). Transfer to a clean plate. Wipe out the skillet and add remaining 2 tablespoons of olive oil. Still on medium heat, cook the shallots and mushrooms, while stirring, until they soften and the mushrooms darken in color, 4 to 5 minutes. Add the garlic and thyme and cook, while stirring, for another minute. Pour in the white wine, turn up to medium-high heat, and cook for a couple minutes until reduced down almost all the way. Stir in the chicken broth, cream, salt, and pepper. Add the chicken back into the pan and cook until sauce comes together and the chicken is reheated all the way through. Sprinkle with more fresh thyme for garnish (optional) and serve over polenta (recipe below) if desired. Combine the milk, broth, cornmeal, and salt in a medium saucepan over high heat. When the mixture comes to a light boil, turn the heat to medium low, and simmer for 15 minutes, or until the liquid has been almost completely absorbed by the cornmeal. Whisk every few minutes so it doesn't stick to the bottom of the pot. Add more liquid if necessary to keep the polenta from becoming overly thick. Sprinkle with Parmesan cheese and serve. 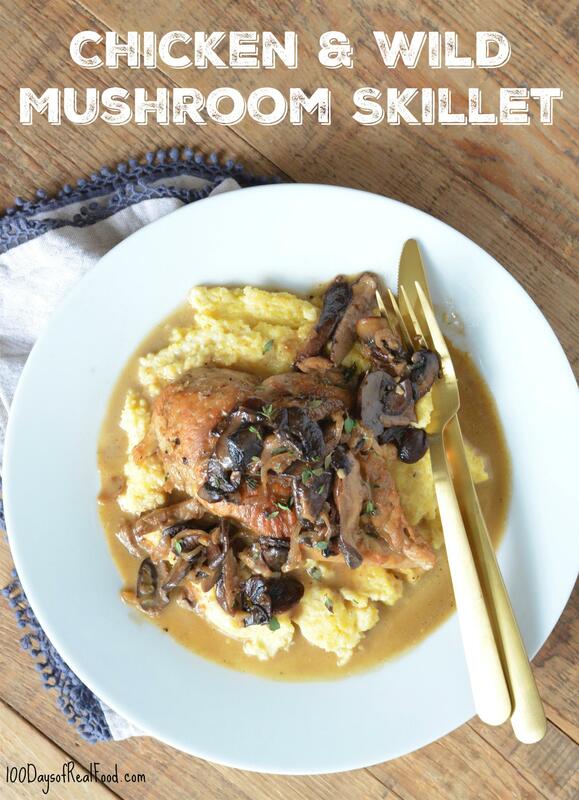 This looks really good, however, what else do you suggest in place of mushrooms? My husband will FOR SURE know there’s mushrooms LOL! Look up the Prosciutto Wrapped Scallops recipe on the website. There is a polenta recipe there. This looks delicious but my household is dairy free due to allergies. What would you suggest as a sub for the heavy cream? Thanks! coconut cream – I use canned coconut milk – don’t shake it, just skim the cream off the top. Looks wonderful! But, alas, no polenta recipe. Do a search for polenta in the search box top right corner of her page. The scallops recipe has a polenta recipe. I would love the polenta recipe. Or grits if you have good recipe. I can’t wait try this! 3 of us like mushrooms and two of us don’t. We actually only give mushrooms to the mushroom eaters. My husband can dectect any stray mushroom no matter how small. So my philosophy is why waste perfectly good mushrooms, on people who won’t eat them anyway. Can I use condensed milk in place of cream? I can’t buy milk or cream because it always ends up going bad before I can figure out a way to use it all. Or maybe there’s another recipe you can recommend that will use up the rest of the cream? I made this last night with morels we picked and dried last spring. So good! I served mine with risotto. Made this over the weekend – it is DELICIOUS! I love your recipes! Why do receipes not list calorie count? Hi. We do not include nutrition details with our recipes. These posts help explain why: https://www.100daysofrealfood.com/do-not-count-calories-still-lose-weight/ and https://www.100daysofrealfood.com/healthy-eating-defined/. So good!! 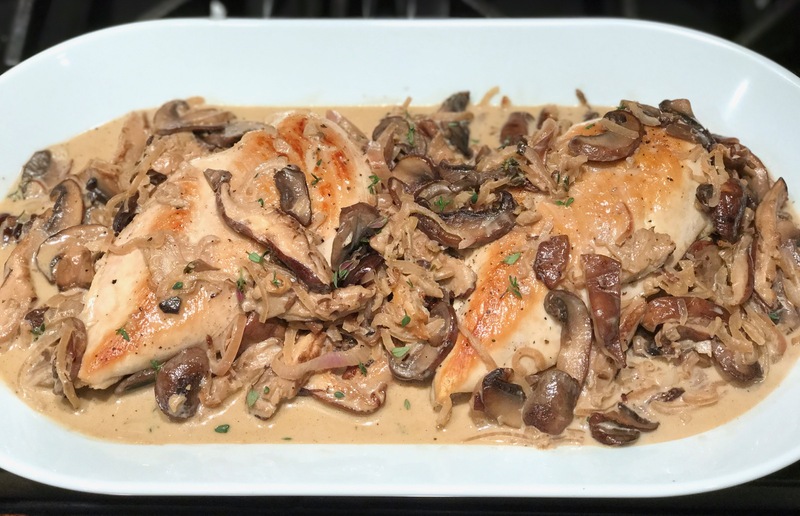 Thank you for this recipe; my husband does not like mushrooms so I always avoid recipes that include them, but decided to try this one because of your comments that your family also does not like them. Hubby approved! I dont like thyme so I’ll use less of that next time, and did not have white wine on hand so substituted with rice wine vinegar. Also, I had no idea polenta was so easy, will be making that more often!! Chicken and Mushroom always good to get protein and calories. And I think it’s good enough for dinner. I will try to make with your instruction! In just 40 minutes I had prepared this dish from start to finish, including the polenta and some oven-roasted asparagus. Not bad! My 3 and 6 year old boys gobbled it up, and want to have leftovers for lunch tomorrow. :-) (Husband missed out while traveling for work!) Was very tasty and easy. I love this blog’s recipes!